I don’t know about you, but when I started “cleaning up” my lifestyle habits, I felt like the easiest place to start was by changing my diet. I probably did things a little too drastically at first, but I eventually found my groove and soon felt the need to start upgrading other things that I used in my daily life, too– like my beauty products, cooking tools, and cleaning products. I think it’s important to make these steps gradually, as it’s overwhelming to try to do it all at once, so these small changes can soon become second nature without taking any more effort on your part. This post is sponsored by Mighty Nest. One thing that I hadn’t found a good replacement for up to this point was plastic wrap. Usually, I can transfer leftovers or chopped vegetables to one of my glass storage containers that come with a lid, but every now and then it I can’t help thinking it would be SO much more convenient to just have something I could tightly wrap over the bowls I was already using, or to individually wrap up a block of cheese or half of a lemon. 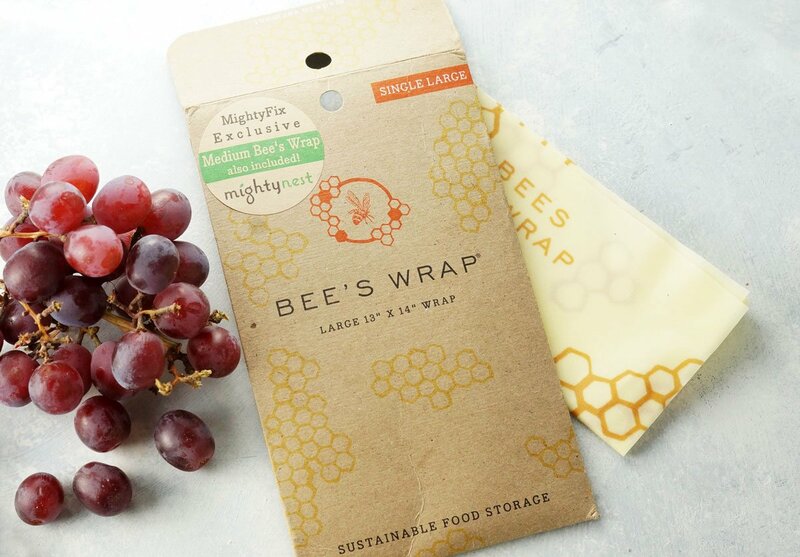 Just like plastic wrap, Bee’s Wrap is perfect for wrapping up a sandwich in a packed lunch, storing a chunk of leftover sliced fruit or cheese, or covering a bowl or mug to store in the fridge. The warmth from your hands naturally helps to create a seal, and as the beeswax cools the material stiffens and holds the seal in tact. 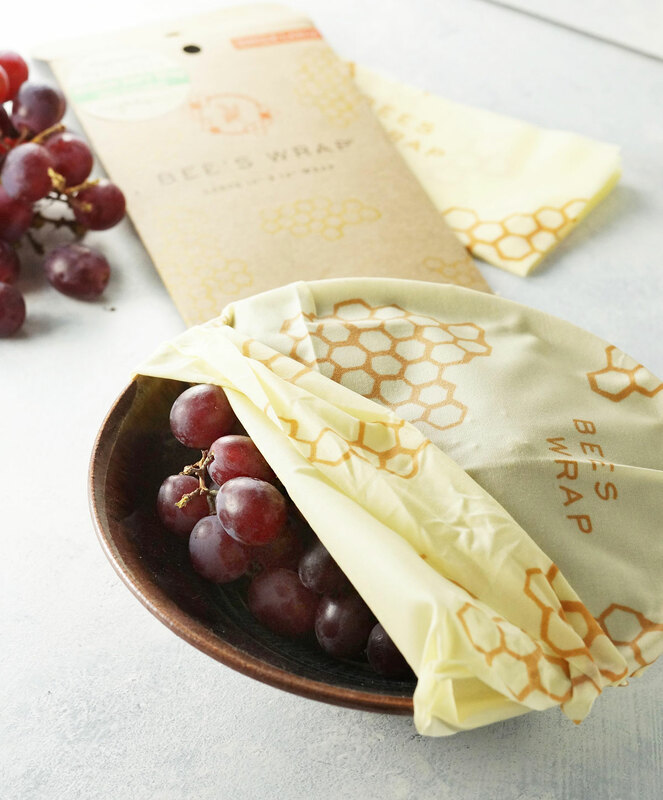 Another cool perk of Bee’s Wrap is that the beeswax and jojoba oil have natural antibacterial properties to help keep food fresh. It’s also easy to maintain– simply wash with cool water and mild dish soap, then allow to air dry before you fold it up like a dish towel or roll it up to store. If you’re like me and might be hesitant to try something new, I’m happy to let you know that I’ve teamed up with Mighty Nest again to offer you TWO sheets of Bee’s Wrap– a medium and large size– for just $3. (With shipping, that’s over an $18 value.) So you can try it with virtually no risk! I hope you enjoy this plastic-free alternative as much as I do! Reader Feedback: Any other non-toxic alternatives you’ve been enjoying lately? Disclosure: This post is sponsored by Mighty Nest, a company I love working with because they sell exclusively non-toxic products and donate a portion of each sale to local schools. As always, I will only share products that I would use in my own home– and I’m pretty picky! What do you recommend to use for freezing food? I make a big batch of waffles for our family, and then freeze them for easy breakfast options in the morning. I have been using plastic bags but WANT to avoid that. What do you suggest? THANKS!! Love your blog so so much!! You might want to try it again– I just tried clicking on the link myself, and the promotional code worked! Hi Megan! I was wondering what your thoughts are on giving young children cows milk to drink daily? Thank you in advance if you respond! Megan, tell me where do you get raw goat cheese and goat or sheep’s milk yogurt? What brand are you finding. I’m lactose and food sensitive to all diary products and would like to find a good alternative. I’m currently using Almond and Coconut milk, but would like to include a good yogurt into my diet. I find them the most easily at Whole Foods, though smaller natural grocers will carry them as well. The brands I find most often are Mt. Sterling, Alta Dena, and Redwood Hills Farms. Just wondering what you use to colour your hair- I’ve noticed it is sometimes lighter, sometimes darker and I have yet to find a natural alternative to dye/lighteners. Thoughts? I have yet to find a 100% natural lightener, other than lemon juice which I used as a teen. 😉 I briefly used henna when I wanted to add color/richness to my hair, but for lighteners I see a stylist who uses Aveda products, as they are a company that seems to care about sustainability and use less synthetic ingredients than other brands. I’ll be sure to post if I find a better alternative in the future! I am also interested and can’t wait to learn more about safe hair dyes. I really enjoy your recipes and I am definitely trying this one, and best wishes on your upcoming delivery. I also want to mention that David Wolfe came out with a hair dye called Hairprint. I don’t color my hair anymore so I haven’t tried it, but it sounds like a good alternative.